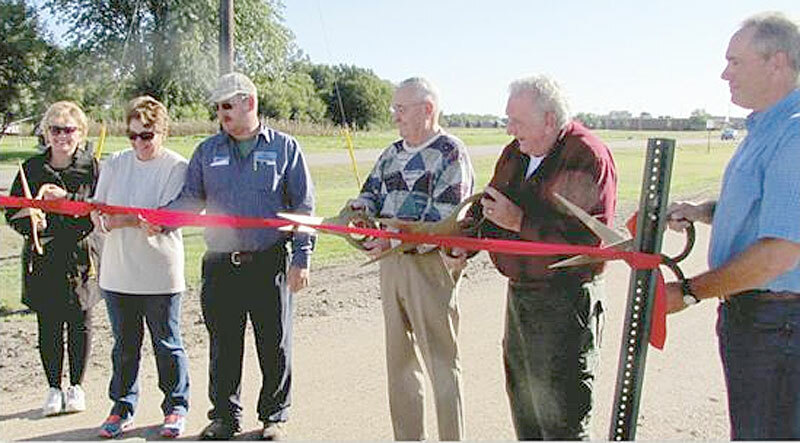 Lester Prairie celebrated the opening of the Dakota Regional Trail to its city limits in Sept. 2015. Pictured at the ribbon-cutting are Sheila Jilek, Mary Behrens, Darian Litzau, Ed Mlynar, McLeod County Commissioner Sheldon Nies, and McLeod County Parks Supt. Al Koglin. Where: The trail is a former railroad corridor extending 44 miles from Hutchinson to Wayzata. In September 2015, a 1.3-mile segment west of the Carver/McLeod county line opened to allow users to enter Lester Prairie. Features: Near Lester Prairie, the trail features a packed and leveled gravel surface. Parts of the trail are paved. No motorized vehicles are allowed except snowmobiles, which can be used west of McLeod County Road 9.